More than 40 years ago, Michael Budow and Allan Noble met as associates at the Chevy Chase law firm of Clancy and Pfeifer. 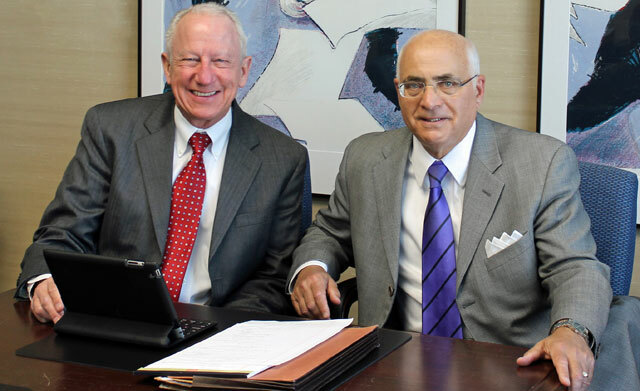 In 1978, Mike and Allan became partners at Clancy and Pfeifer and shared the same passion for civil litigation. In 1981, they decided to start a practice dedicated solely to civil litigation. In February of 1982, the Law Firm of Budow and Noble, P.C., formally opened its doors in Bethesda, Maryland, and was comprised of only three attorneys. Since the inception of the firm, Budow and Noble, P.C. has maintained law office locations in both Bethesda and Ellicott City. Over the last 30 years, Budow and Noble, P.C., has quickly grown and its size ranges from twelve to fifteen attorneys, including seven partners: Walter Gillcrist, Jr. (1993); Anne K. Howard (1995); Laura Basem Jacobs (2005); Melissa D. McNair (2014); and Howard R. Meinster (2014). We are proud that our partners have devoted most, if not all, of their professional careers to the firm and serving our clients. In fact, we have enjoyed long lasting relationships with our clients, many of whom we have had the pleasure of serving since the start of the firm. All of our attorneys strive to provide unparalleled representation both in and out of the courtroom, and we possess extensive experience in a broad range of trial, appellate, class action and administrative matters. We practice in federal and local courts, where our attorneys have tried many cases of first impression, which decisions have molded and served as cornerstones for common law in both Maryland and the District of Columbia. Mike Budow and Allan Noble are proud to have created a law firm that specializes in civil litigation and provides quality representation to insurance companies, businesses, self-insured entities, local governments, and private individuals alike. Their law partners have helped build the practice through the pursuit of excellence in the law and by providing ethical, reliable, and proactive representation to each and every client.